"Henry Head inside Botany Bay has some amazing sponge life"
The eastern side of North Solitary Island off Wooli on the North Coast of New South Wales is one of the most undived locations in the State. In all my visits to the Solitary Islands, it was a long time before I had even seen that side of the island, let alone dived it. Even now, I have only ever dived there three times. You need relatively calm conditions to dive this location. North Solitary Island is actually made up of two parts. There is a small channel that separates the two sections. This is about five metres wide at the narrowest bit. While the island runs roughly north-south, the channel runs north-east to south west. It is located roughly in the middle of the island. From Mullaway, it is about 45 minutes out to North Solitary Island. Unlike the western and northern side of the island which are quite shallow, the eastern side drops away to be deep. I am not sure how deep it gets to, but on the western side of the north point it gets to at least 40 metres. On the eastern side of the middle of the island, it gets to over 25 metres just a few metres from the island and over 30 metres not too far off. This site is just north of the channel between the two parts of the island. As there are no moorings on this side of the island and (I think) anchoring is not permitted, your boat will drop you off and have to wait for you to surface. About 50 metres north of the channel there is a small inlet. This is the normal starting point for the dive. As can be imagined from the name, the dive site primarily consists of huge boulders and a couple of gullies. After entering the water, swim a little towards the island and descend. The depth right alongisde the island is about 20 metres. If you head south from here you will enter a gutter or gully. 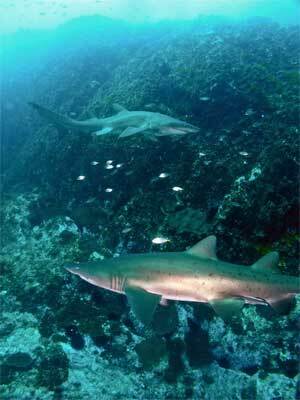 This is a "blind" gully and is sometimes home to grey nurse sharks. This gully does not run for a long distance and at the end you need to come up to about 12 metres as you drop over to the east. You enter another larger gully, this time the eastern wall is not a solid wall but a series of boulders. There are more grey nurse sharks in this section. The depth here is drops from about 12 metres down to over 25 metres. The boulders house plenty of caves and swim-throughs. Below one enormous rock there are three caves, one of which on my first dive here contained the biggest non-shark fish I have ever seen. This Queensland groper was at least two metres long and it darted out of the cave as I entered. Luckily it was seen by other divers in one of the gullies. As I mentioned before, grey nurse sharks swim along the gullies and some large rays add to the black corals and firefish seen. On every dive at this site I have seen sharks, and most times a number of black or estuary cod as well as prolific fishlife. Continuing south along the gully you first come into narrow gullw where the bottom is a V shape. A bit further on it opens up and then changes into a more open area. 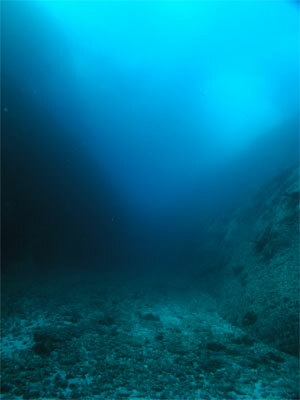 The depth varies between 15 and 20 metres. Shortly you will see that the wall on your right turns a little to the south-west and then on your left you will see another. This is the channel between the two parts of the island. As you approach the channel it looks like swimming up the Grand Canyon. The bottom is composed of small round rocks. There are huge schools of small bait fish that seem to flow off the walls of the canyon, especially on the southern side. It looks like a waterfall and is quite a sight. You can swim right up this channel to about 12 metres before you should turn around. The first time I dived here we just did a simple up and down dive. However, the next time (April 1997) we did this as a "drift" dive (not really a drift as there was no current). See the separate article about the drift dive. If you are doing this as a simpe dive, come back out to the entrance to the channel and go a bit further to the south. As this is a bit deeper than the normal dive sites at North Solitary, you will need to keep a good track on your remaining bottom time. You will probably get about 40 minutes before you need to ascend, depending on where you spend your time. When you have about 10 minutes bottom time left, head back north to the Boulders and then spend your remaining bottom time around the top of the rocks and the wall between the first gully and the second gully. On this dive you will see grey nurse sharks, Queensland groper, black cod, huge rays, eagle rays, firefish, bream, kingfish, yellowtail and lots more. A fantastic dive site.